HTC EVO 3D, the most expected glasses-free 3D smartphone, has just been announced officially a few days ago in Europe and will be available this July. However, the SIM-free version wouldn’t be released as soon as we expected. We will have to wait till the end of this summer to get the phone. 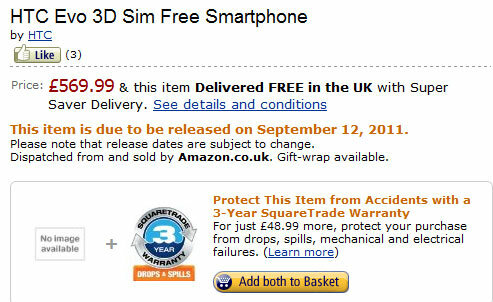 The HTC EVO 3D SIM-free version is now available for pre-order on Amazon UK and they say that it will be started shipping on September 12, 2011. It is 2 months ahead and I believe it could be changed to an earlier date. The price tag is set at £569.99 (about $920) which is quite expensive compared to other top Android smartphones at the moment. Maybe getting one with Vodafone’s contract would be a better choice for us.